Sold in April 2015, the 25.6 metre explorer motor yacht Voyager is back on the market, listed for sale by Lukas Stratmann at Ocean Independence. Custom built in steel and aluminium as a full displacement motor yacht by Portuguese shipyard Yacht Algar Construcao De Iates to a design by Stephen Seaton, this pocket superyacht was delivered in 2004 and is powered by two Caterpillar 250hp engines that allow her to reach a top speed of 11 knots and cruise comfortably at 10 knots. She is a comprehensively equipped yacht built for extensive cruising and excellent fuel economy and has benefitted from major refits during 2007 and 2015 with many enhancements and a full exterior repaint. The main deck saloon is roomy with comfortable seating and large windows. To port is an entertainment centre including a 42-inch Samsung home theatre system while forward is a dining area with an extendable table seating up to eight guests. 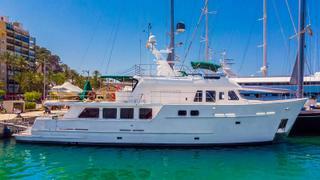 Further forward still on this yacht for sale is an open plan galley leading up to the wheelhouse. Voyager sleeps six guests in three cabins consisting of a master suite, a double and a twin, all with en suite facilities, and boasts a professional and attentive crew of four. Lying in Spain, Voyager is asking €1,490,000.